RSMSSB LDC Recruitment 2018 - Apply Online for 12456 LDC / Junior Assistant Posts in Departments/ Offices Under State Govt, RPSC & Govt Secretariat, Rajasthan on Direct Recruitment. 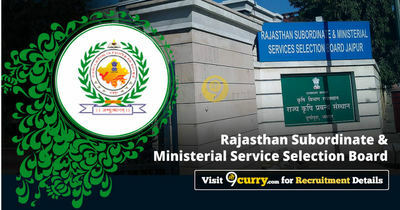 Online Applications are invited by Rajasthan Subordinate and Ministerial Service Selection Board from 10 May 2018 to 08 Jun 2018 (Extended till 15 June 2018 till 12 Night) for 12456 vacancies. 12th Pass Certificate with the Computer Science/ Computer Application as one of the subjects. Candidates will be selected on the Basis of Written Exam and Typing Speed Test.